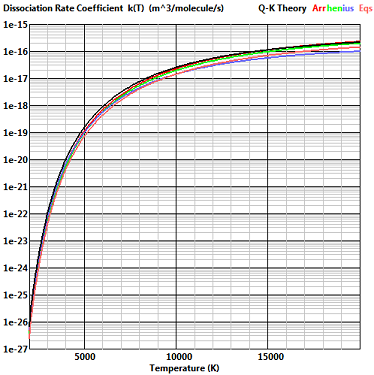 This is the reaction with the least scatter in the published lists of reaction rates in high temperature air and the dissociation rate of Eqn. (4) is in agreement with these rates. 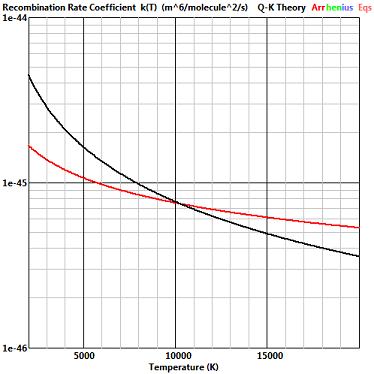 It is now customary in continuum CFD to calculate recombination rates from the equilibrium constant, but the “consensus rates” of Bortner included an explicit recobination rate and this is compared with the rate given by Eqn. (7). This is the worst case for the agreement between the Q-K and established rates when the default activation energy is employed. It is greatly improved when the “ equilibrium energy barrier” is applied. 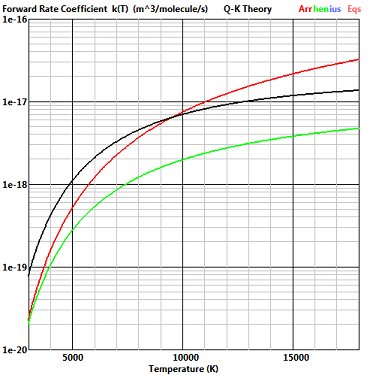 The red curve is the old Kang and Dunn rate, while the green curve is the rate in the NASA DPLR program. 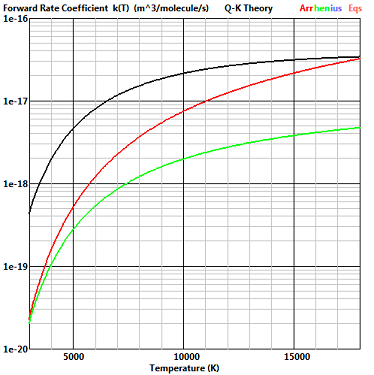 The Q-K rate could be bought into agreement with the latter if an energy barrier was applied to the reverse as well as to the forward reaction.